A nice vintage 1972 ring from Avon. 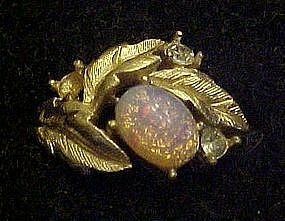 THis ring called fireflower because of the fire opal stone surrounded by gold leaves and rhinestone accents. Gold tone setting, Size 10 and is in wonderful condition. A very pretty ring.